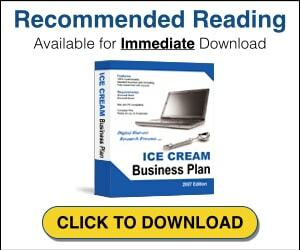 The Gelato Business Plan is a comprehensive business plan template for those looking to start a gelato business. If you’re trying to write a business plan for a gelato shop but don’t know where to start, this plan is for you! Learn what you will need to include in your business plan, find out the latest industry statistics, view sample financial worksheets, and get started on writing your own solid business plan. Business plans are essential when starting a new business, especially with today’s economy. Financing can be difficult to obtain, but having a detailed business plan can help you receive the money you need to start your business. A business plan will help you decide exactly how you are going to run your business, what you intend to sell, and if your proposed business makes sense financially.